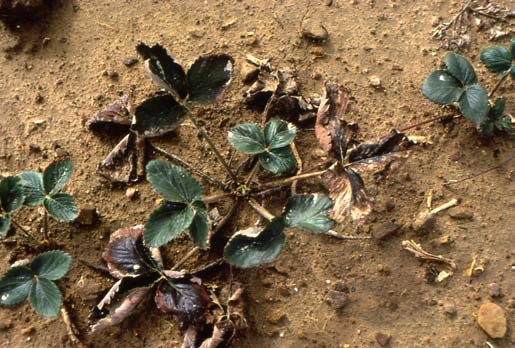 Verticillium wilt of strawberry can be a major factor limiting production. When a plant is severely infected by the Verticillium wilt fungus, the probability of it surviving to produce a crop is greatly reduced. The Verticillium fungus can infect about 300 different host plants, including many fruits, vegetables, trees, shrubs and flowers, as well as numerous weeds and some field crops. The fungus can survive in soil, and, once it becomes established in a field or garden, it may remain alive for 25 years or longer. Figure 1. Strawberry plant infected with Verticillium wilt. Cool, overcast weather interspersed with warm, bright days is most favorable for development of Verticillium wilt. Infection and disease development may occur when soil temperature is from 70 to 75 degrees F (21 to 24 degrees C). Many soils in Ohio contain the Verticillium wilt fungus. The fungus can be introduced into uninfested soil on seed, tools and farm machinery, and in the soil and roots of transplants. The first symptoms of Verticillium wilt in new strawberry plantings often appear about the time runners begin to form. In older plantings, symptoms usually appear just before picking time. Symptoms on above-ground plant parts may differ with the susceptibility of the cultivar affected. In addition, above-ground symptoms are difficult to differentiate from those caused by other root infecting fungi. Isolation from diseased tissue and culturing the fungus in the laboratory are necessary for positive disease identification. On infected strawberry plants, the outer and older leaves droop, wilt, turn dry and become reddish-yellow or dark brown at the margins and between veins. Few new leaves develop, and those that do tend to be stunted and may wilt and curl up along the midvein. Severely infected plants may appear stunted and flattened, with small yellowish leaves. Brownish to blueish-black streaks or blotches may appear on the runners or petioles. New roots that grow from the crown are often dwarfed with blackened tips. Brownish streaks may occur within the decaying crown and roots. If the disease is serious, large numbers of plants may wilt and die rapidly. When the disease is not so serious, an occasional plant or several plants scattered over the entire planting may wilt and die. Figure 2. 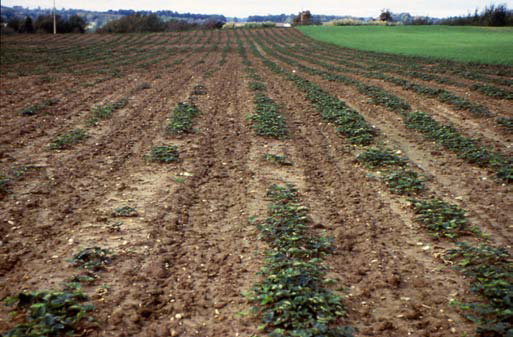 A strawberry field severely affected by verticillium wilt. Verticillium wilt is caused by the soilborne fungus Verticillium albo-atrum. The fungus overwinters in soil or plant debris as dormant mycelium or black, speck-sized bodies (microsclerotia). These microsclerotia can remain viable in the soil for many years. Under favorable environmental conditions, they germinate and produce threadlike fungal structures (hyphae). Hyphae can penetrate root hairs directly or through breaks or wounds in the rootlets. Once inside the root, the fungus invades and destroys the water-conducting tissue. The destruction of water-conducting tissue results in reduced water uptake by the plant; thus, the plants wilt and wither. As fungal colonies get older they produce microsclerotia in infected host tissue. As these infected tissues die and return to the soil, the disease cycle is completed. Do not plant susceptible strawberry cultivars in soil where tomato, peppers, potato, eggplant, melons, okra, mint, brambles, stone fruits, chrysanthemums, rose or related susceptible crops have grown for the past five years. Plant in fertile, light, well-drained soil. Avoid low, wet spots. In Verticillium-infested soil, set out only certified, disease-free strawberry plants of tolerant or resistant cultivars. Several old and new cultivars have natural resistance to the Verticillium fungus. The following junebearing varieties are reported to be resistant to Verticillium wilt: Allstar; Catskill; Delite; Earliglow; Guardian; Lester; Rechief; Scott; Sunrise; Surecrop and Tennessee Beauty. The everbearing varieties, Tribute and Tristar, are also reported to be resistant. The use of resistant varieties is one of the most important control methods for this disease. New varieties are constantly being developed and released. Check with your nursery or local Extension educator to see if resistance to Verticillium wilt and other diseases is available in new varieties. Verticillium-susceptible cultivars may be grown in infested fields if soil fumigation is done as a preplant treatment. Soil fumigation is not an option in home or backyard plantings. If properly done in commercial plantings, fumigation kills soil insects and weed seeds as well as disease-causing bacteria, fungi and nematodes. Fumigation is usually done by commercial applicators who are licensed to handle restricted chemicals, and not by the grower. The soil fumigant that is most effective is a mixture of chloropicrin (tear gas) 33 percent and methyl bromide 66 percent. New soil fumigants are currently being developed to eventually replace methyl bromide. Check with your county Extension educator for information on new soil fumigants. Figure 3. Some common strawberry root problems and typical symptoms.